Believe it or not, up until a few days ago, I hadn't been into Forever 21 in over a month. I know, coming from me that is like an eternity. I have been doing more online shopping than being hands on in a store. It's just easier for me to hop on the computer during the summer since I have my girls at home. It saves me money too because I have quite possibly passed on my love for clothes to them. In their little minds they think if we go anywhere they are entitled to get a "prize" for being well behaved and those "prizes" are a little more expensive these days. Giving them a quarter for the bubblegum machine doesn't quite excite them like it used to. My girlfriend gave me a gift card to Forever 21 for my birthday and I actually got a little "momma" time to shop in peace. I found this printed top and matching skirt tucked away in an area of the store where I knew it wasn't supposed to be. I have a feeling that someone was hiding it between clothes because it was the last one of the top and size in the skirt. Have you ever done that, hide clothes, shoes, a bag or accessory when it's the last one left? I must admit, I am shamefully guilty, especially when a store won't do overnight holds and I need to go home and sleep on my pass or purchase decision. Sorry to the person that possibly hid this outfit. For the price, fit comfort and cuteness, I didn't have a reason to search out another secret hiding spot. Cute print! I do most of my shopping online, but still definitely enjoy being able to shop at stores by myself when I get a chance. Have a wonderful day! Love the print and silhouette of that cute dress. It has such a cool boho vibe. And I love when I find hidden treasures in a store. Especially at F21 which is usually like a zoo. LOL I would have scooped this up right away, also. =) You always have the cutest pieces from F21 though, always. Have a great start to the week Shanna. Hope you and your family are doing well. I haven't heard from you in a while so welcome by when you can. I love this set, I thought it was a dress originally. Shopping in store is always worst for me because I always stumble upon something I didn't know I need in the first place. If you get the chance, please share your amazing post on my link-up today. Cute, You would never know it was two pieces. I have heard so much about Forever 21, never been though. I totally thought this was a dress - love it even more knowing it's two separate pieces...and that print is so pretty! Great find!! I totally thought this was a dress! I LOVE IT! Totally bohemian and super cool! I thought this was a dress! I love how you put the top and skirt together. It looks great - so flowy and comfy. Love, love - as always! OMG I didn't realize those were separates! I really need to get on the matching separates band wagon. This red number is so cute on you! I have definitely done that...but it seems like I am NEVER able to find them again! Maybe that's my punishment. This is such a cute idea, especially since I've been seeing a lot of stores making separates in the same print. Beautiful and I love that tunic. Also great shoes as well. Did you get a haircut? It looks fresh! You look laid back summery, and I like it! I am a forever 21 junkie. Honestly, I hardly shop anywhere else- they just have so much stuff that I adore!! and i love this and have definitely hid an item before- oops! I can't handle shopping in Forever 21. I get so overwhelmed and feel like those young gals are judging me, "Lady, you need to be shopping at Forever 42!". HA HA. I do most of my shopping online because I love to use ebates and to take my sweet time. You print is so eye catching and I love the colors. SO cute! Glad you finally got some shopping time, in! Love your necklace, too!! Oh my gosh! Totally in love with look! You're making me want to head to F21 right this minute! This combo is so cute! I've totally hid things in stores before, but I rarely actually go back for them. Sorry, retail employees! Love the whole outfit -- looks great on you! Such a cute matching set, I love it! That ring is awesome!!!!! I haven't been in Forever 21 in years (we don't have them in Italy) but I'm in love with that shirt/skirt combo! I need to shop at Forever 21 more. You look incredible! 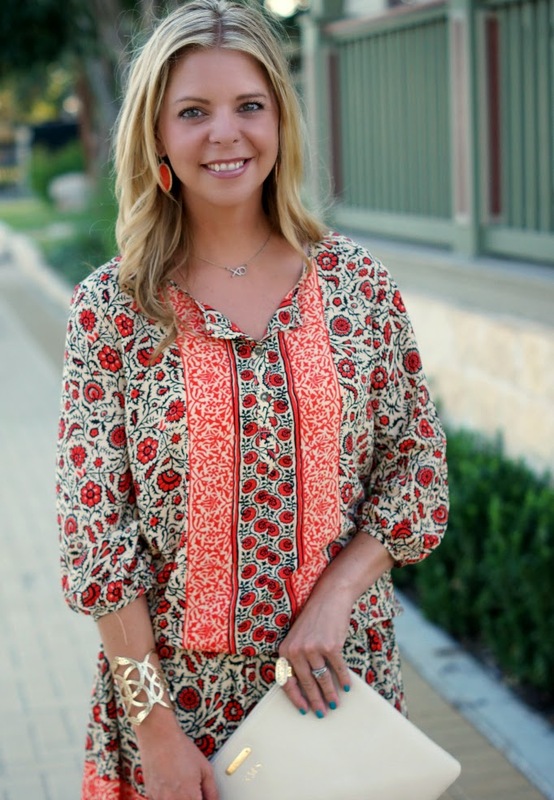 And I am OBSESSED with that Kendra Scott cuff! I love this! I can't believe it's a top and a skirt. I went into Forever 21 a few weeks ago and felt SO OLD!! Everyone in there was definitely under the age of 18! However, you wear their clothes like a rockstar! Such a pretty outfit, girl! And man, I'm impressed... I haven't purchased anything from F21 in ages because I get so overwhelmed when I walk in that I just walk right back out! Ha ha! My son thinks he gets a prize too whenever we go to Target. =) Love this matching set...SO cute! I just realized I haven't shopped at F21 in MONTHS. I've always been an online shopper but I am WAY overdue for a F21 shopping spree. Shanna I would hide clothes too! LOL. Oh yeah I do that hide and seek thing hahaha esp. at Forever 21 or Marshalls. And lucky you finding this "dress suit" ....love the boho vibe it exudes! So pretty Shanna! I love the print, and your hair is looking fab! I thought this was a dress at first! Love everything about this outfit. The color and print are amazing! Lol. You have your hands full with those two fashionistas! A month without F21?! I'm shocked! I totally thought that was a dress and not a top + skirt. Even better because you can wear them separately too! Great find on the secret hiding spot! 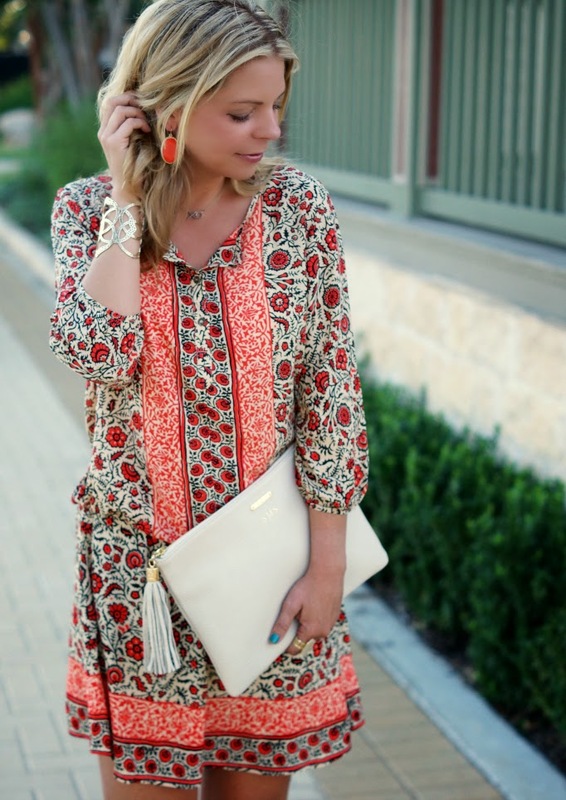 Coral is becoming one of my favorite summer colors! Everything about this look is perfect, Shanna! haha, so funny about hiding clothes! I'm totally guilty of it! Love this look, the pop of white is so fresh! I've done that! But Forever 21 DOES do holds so IDK why they'd have hidden it lol. They probably WERE going to buy it but passed at the last minute. It's very cute, and I love the loose fit and style.